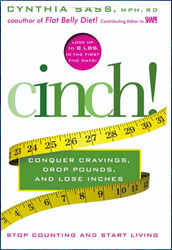 The Cinch Diet is found in the book, Cinch! : Conquer Cravings, Drop Pounds, and Lose Inches is a weight loss program created by Cynthia Sass, co-author of the New York Times Bestselling “Flat Belly Diet“. Cynthia Sass introduces dieters to her 30-day Cinch Diet Plan, which is designed to put an end to overeating by teaching you how to eat the right proportions of high-nutrient foods that enable you to feel full and satisfied. In just one month you will eliminate cravings, recalibrate your body, maximize fat-burning and boost your metabolism as you begin a healthy new relationship with food. The program starts with the “5-Day Fast Forward Plan” where you focus on eating just five foods – spinach, almonds, raspberries, eggs and yogurt – in a variety of different combinations. These foods were selected because they are low in calories but high in nutrients, a combination that helps to reduce your appetite after meals. The purpose of the five-day plan is to help you to detox from unhealthy foods without feeling deprived. Cynthia Sass claims that you can lose up to eight pounds in these first five days of the program. Following this you then continue with the “Cinch Diet Core” where you increase the variety in your diet while focusing on foods that provide maximum fat-burning and metabolism boosting effects. In the Cinch Diet Core Program each meal consists of a balance of whole grains, protein, plant-based fats, fruits and vegetables. Each day you select four daily meals from the recipes provided in the book; all of which are created with the best ratio of carbs, proteins and fat to support weight loss, blood glucose balance, optimal nutrition and satiety. In the Cinch Diet, the fifth meal each day consists of a serving of chocolate containing at least 70% cocoa. Due to research suggesting the positive effects of regular chocolate consumption on weight loss this is a mandatory component of the program, although you can choose the time of the day that you prefer for your “daily chocolate escape”. The Cinch Diet includes over a hundred options for meals and snacks with recipes to provide you with a full thirty days’ worth of choices. As you follow the program you will learn strategies that enable you to create your own satisfying meals so that you can maintain your new healthy eating habits as a long-term lifestyle. Eggs, spinach, raspberries, almonds, yogurt, salmon, sardines, shrimp, tuna, chicken breast, brown rice, oatmeal, whole grain pasta, whole grain bread, legumes, avocado, walnuts, olives, vinegar, citrus juice and zest, hot peppers, herbs and spices, tea, dark chocolate. Cynthia Sass considers exercise an essential part of The Cinch Diet because research shows that it is important for speeding up weight loss and for keeping the weight off. Brisk walking is recommended for at least 30 minutes, 5 days a week. Cinch! : Conquer Cravings, Drop Pounds, and Lose Inches (Now Called SASS! Yourself Slim) retails at $25.99. The Cinch Diet plan is based on nutritious whole foods. Provides dieters with choices and freedom within a structured meal plan. Gives options for vegetarians and vegans. Requires chocolate once a day. Addresses the subject of emotional eating. Many of the recipes will require some time to be spent on preparation. Will not appeal to dieters who don’t enjoy a very structured diet plan. Very difficult to follow the Cinch Diet when eating out. There is a risk of rebound weight gain when normal eating is resumed. The weight loss plan provided in the Cinch Diet will appeal to dieters who want to eat more natural and organic foods but don’t know where to start. The 30-day plan will help to reset your taste buds and recalibrate your metabolism as you learn a foundation of healthy eating habits that can be continued as a lifestyle approach to weight management.